If you have a young thrill-seeker or adrenaline junkie on your hands, there are few better ways to keep him or her occupied this summer than go-karting. 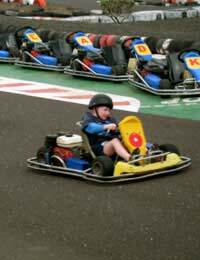 Go-kart racing is actually becoming a highly popular activity for children, and the beauty part is that it can be performed either indoors or outdoors, so it's not a weather-dependent sport. While the age minimum depends on the locale, some go-karting venues allow children to participate from age six, while special places exist for kids as young as three. You may have to ring around to find a place that will accept young children. Some arenas accept youngsters based on a height minimum, regardless of age. Many of the Formula 1 racers you see competing today started their training as youngsters on go-karts on indoor tracks. If your child shows serious interest or promise, special classes which take children from as young as age eight are available. To put it simply, it's a type of open-wheeled motor sport with small racing “cars” called go-karts. Go-karting usually take place on small, stylised circuits, and are sometimes seen as a precursor to more serious - and seriously more expensive - motorsports, although go-karting is often a means to itself. The first go-kart was built in the USA in 1956, and since then the prototype has kept on getting better and better. As a result, go-karting has become popular not only in the United States but throughout Europe as well. Racing is usually seen as the best and most cost-effective way to go go-karting. It can be performed by almost everybody, with the vast majority of circuits providing training briefing, safety sessions and protective clothing to get you started. All you really need is the urge to race! Many places offer special outdoor karting tracks, which vary in length, speed and difficulty. Spectators are always welcome, and all kids must be supervised by adults or they are not allowed to take part. Outdoor go-karting can be a plus as many karts produce petrol fumes which can be toxic indoors. However, manoeuvring a kart outside in inclement weather can be tricky, especially for younger drivers. If you decide that outdoor karting is preferable for you and your family, it's probably a good idea to invest in waterproof clothing, just in case. Indoor riding circuits can actually be more challenging than outdoor, as karting enthusiasts have to negotiate difficult bends and thrilling chicanes as they put their karting skills to the limit. The majority of circuits vary in difficulty, and offer children safety demonstrations and proper gear before they set out. Indoor karting for children usually takes place when the arena is closed for adults, which makes it a safer option. Many indoor karting arenas also have hospitality suites, which are perfect for corporate events as well as children's birthday parties. Often they will provide catered meals or allow you to bring your own food and drink. Kids starting age three can also take advantage of specially made go-karts that are designed for small hands and feet. Special arenas for small children cater specifically for parties, and offer not only special go karts but also party venues, bouncy castles, medals for every child etc. Look online to see what is available. Go-karting can be a fun activity the whole family can enjoy. If you live near a karting circuit and do it on a regular basis, your children may be able to turn their interest into a regular hobby – or even a profession! Why not try a day out at an indoor or outdoor arena and see how it goes?